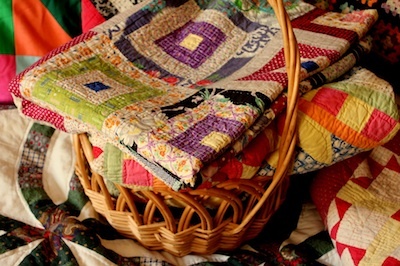 | by Allison Sharp, Jennifer’s sister | I know: You’re thinking, first, who’s Joshua, and, second, how could he possibly dislike the beautiful quilt Allison wrote about last month? (Click here to see it again.) Joshua is my youngest son, and he does not like the complete randomness of jelly roll race quilts. Sadly, my husband doesn’t really care for them, either. I don’t know how you feel about them, but I love them, and I have two more to show you. The first is my happy Random Sunshine Race. 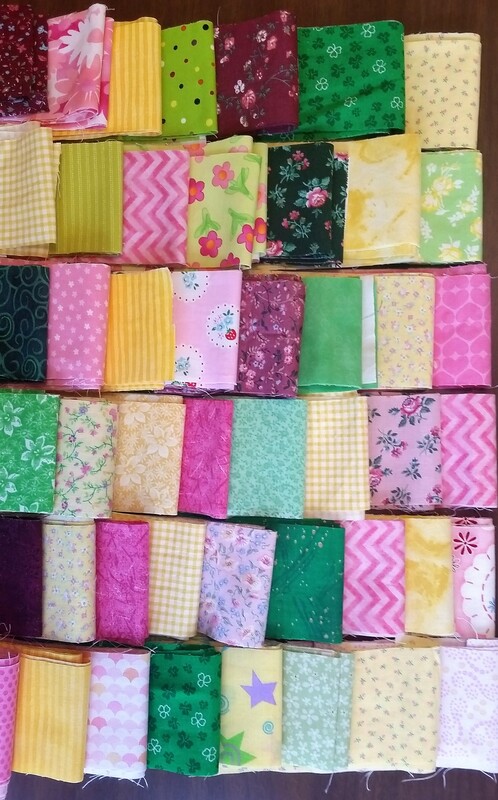 I started with 2 1/2″ strips from about 30 different fabrics. I thought this quilt looked a little odd, and Joshua and his friend–they own the two hands holding up the quilt–thought it was very odd, indeed. But then I added a beautiful border. 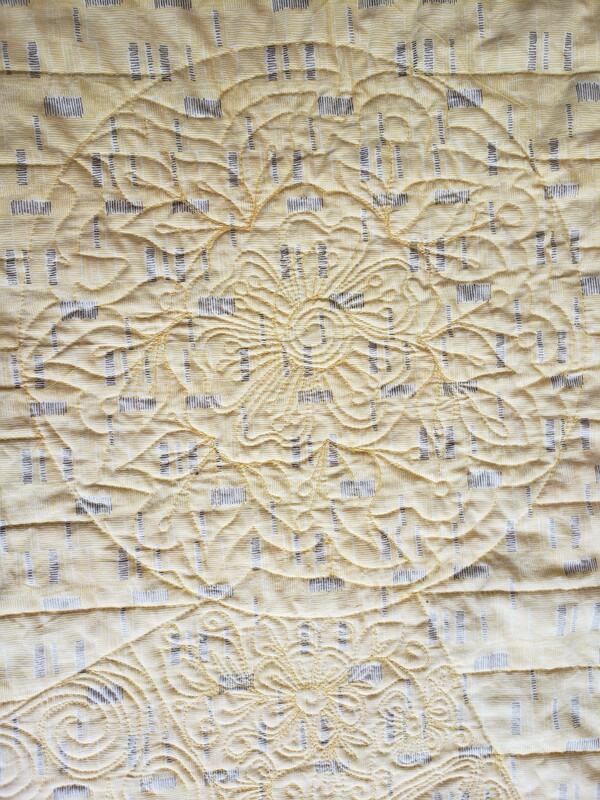 Now the quilt looked happy and not odd, just unique. I knew that the large variety of fabric colors and prints would hide any quilting I might do, so I decided to experiment with different quilting techniques. Here are some photos of the ones I like the best. Be warned, however, that these photos are all from the back of the quilt–where the quilting is easier to see–but that the quilting still tries to disappear into the fabric. 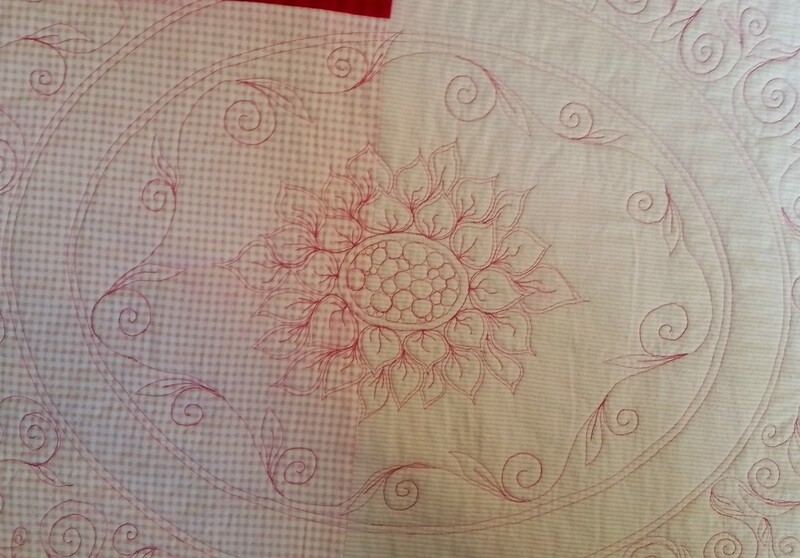 Here is another round quilting motif. I made the back of the quilt from two different pieces of fabric. If you look at the photos above, you’ll see that I tried a new binding technique. Instead of making my binding out of one fabric, I made the binding from some of the extra green 2 1/2″ strips. Here is a photo of the binding on one of the front corners. I have not quite decided what to do with this quilt. I feel happy when I see it, and I love to look at the different quilting techniques, but the men in my house think it’s odd, and I can’t really say that I need another quilt. I’d like to give it to someone who would appreciate a happy, random, unique, imperfect quilt. 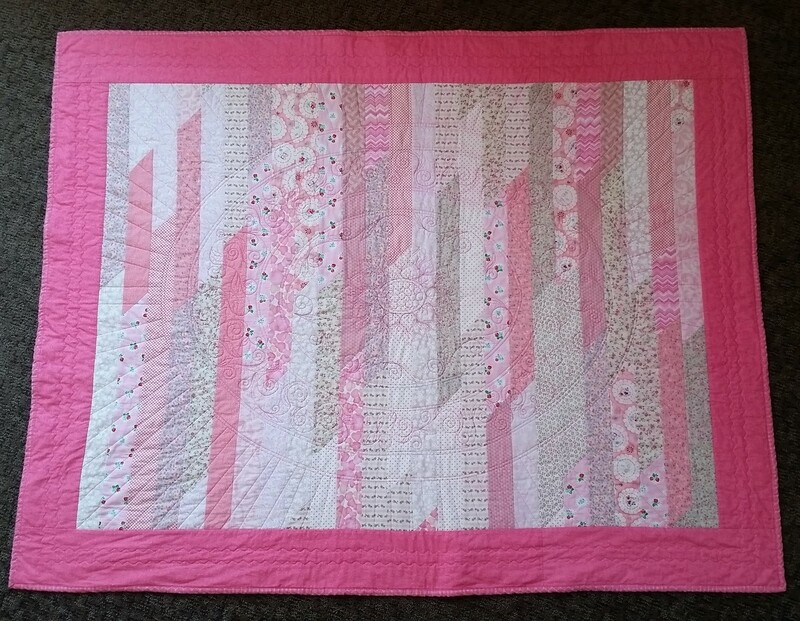 My second jelly roll race quilt is my Pink Baby Race. 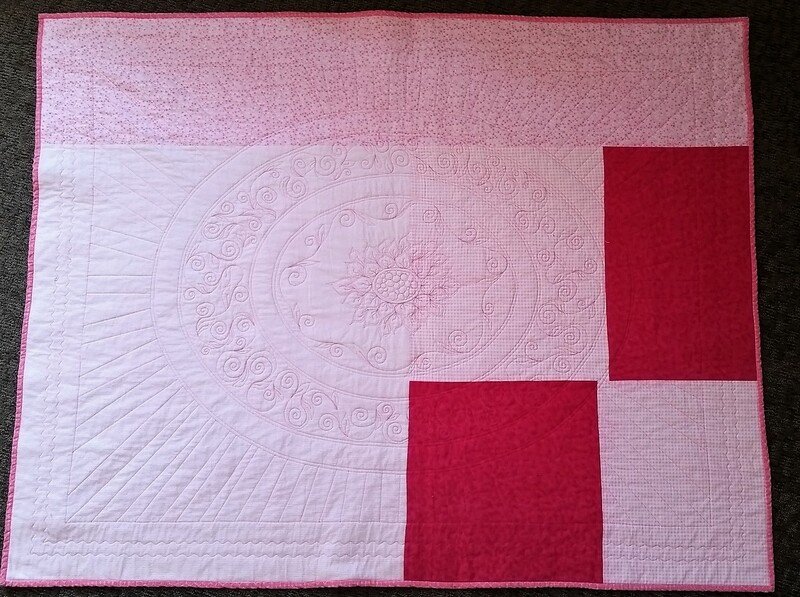 I have massive amounts of pink fabric–no exaggeration–and I’m always looking for fast and easy quilts to make with it. 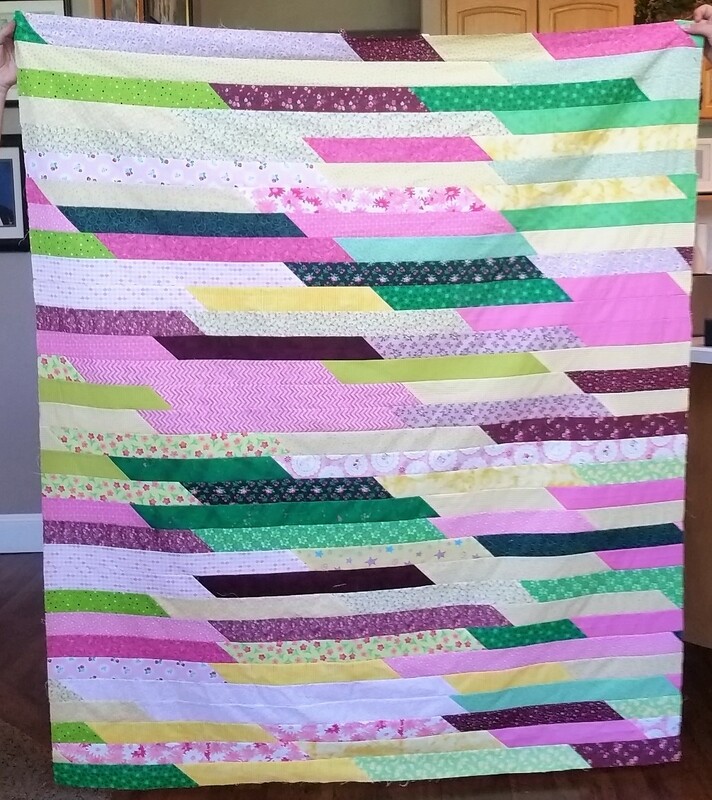 For this quilt, I used 2 1/2″ strips from about 25 different fabrics. 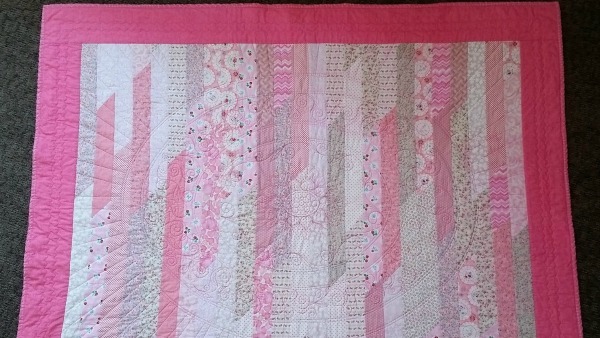 I quite like the randomness of the quilt, and I, again, decided to experiment with some different quilting techniques. 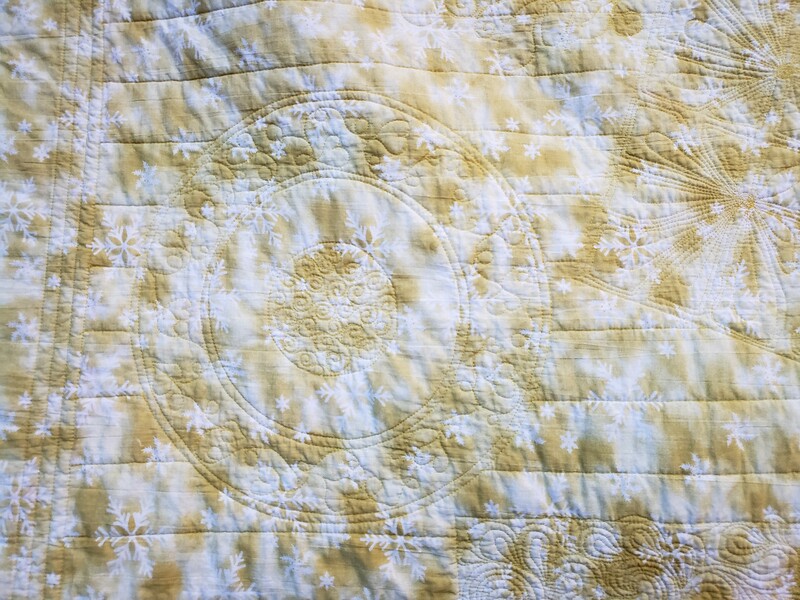 Using a washable fabric marker, I sketched an oval in the middle of the quilt and then used free motion quilting techniques to create a center flower surrounded by swirls. This photo, like those for the Random Sunshine Race quilt, is taken from the back of the quilt. If I had really wanted to hide the quilting, I would have picked a backing fabric that was as busy as the quilt top, but because this quilt was an experiment, I used flannel left over from other projects. Here’s a photo of the back. Can you tell I was starting to run out of pink flannel? 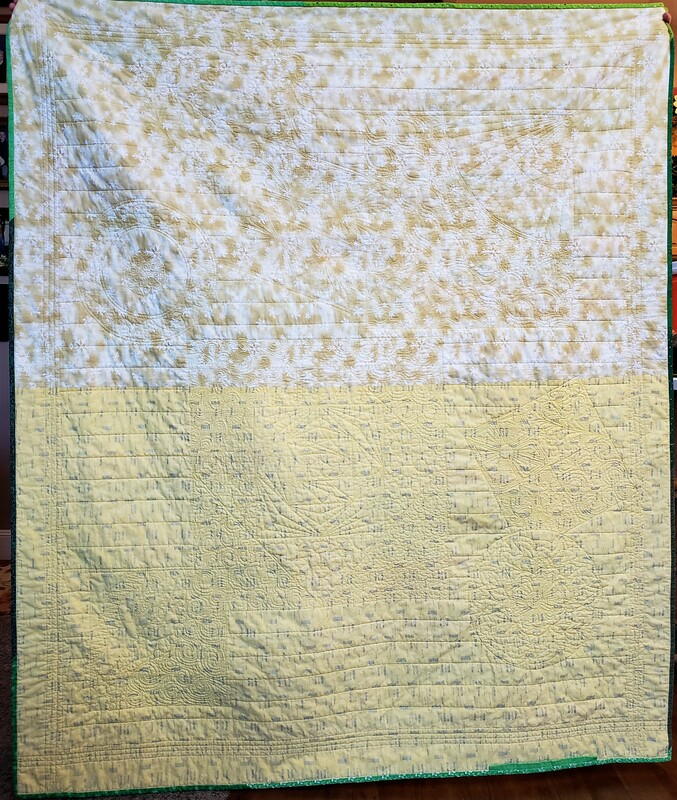 I donated this quilt to a Boy Scout in our neighborhood who was collecting blankets for St. Jude’s Children’s Hospital. 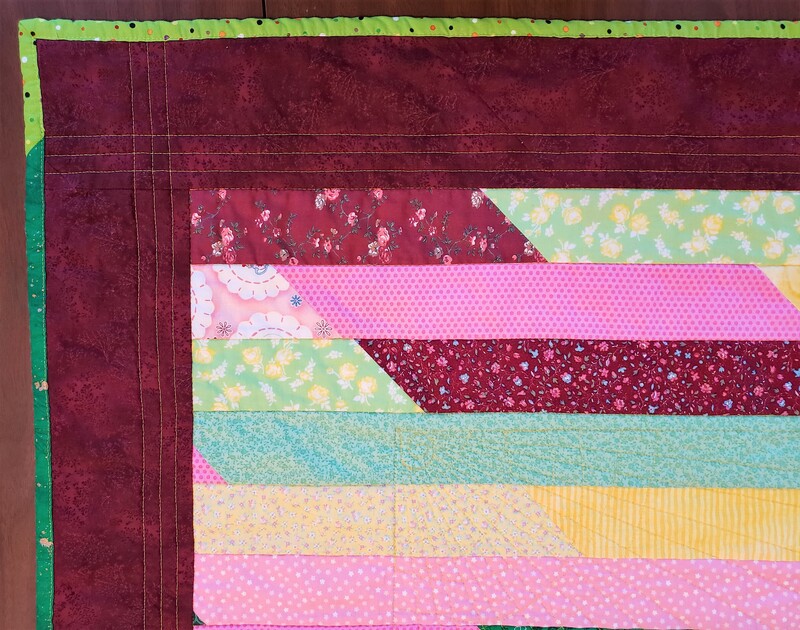 Starting with last month, I have now shown you three jelly roll race quilts. Let me know if you like them, love them, or–like Joshua–barely manage not to say rude things about them. To read about or see some great tutorials on free motion quilting, google Angela Walters, Leah Day, or Lori Kennedy. I have been inspired by all of their ideas. 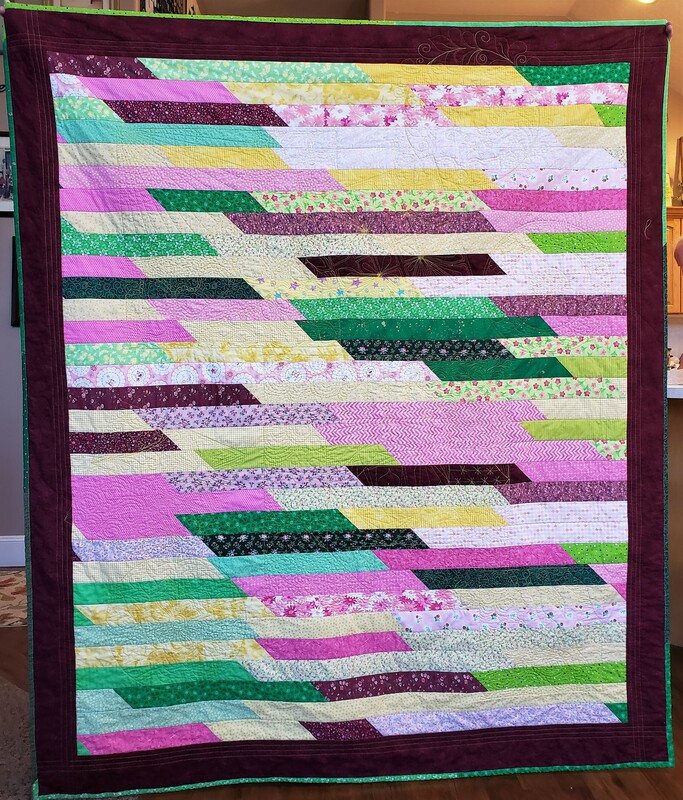 I love the jelly roll race quilts! They are very beautiful. I agree, Nancy. They seem like a carnival in fabric. Yes I love that you can use any colors of fabric and any pattern. I love the pink baby one! It is so cute and cheery. Thanks for showing these quilts!